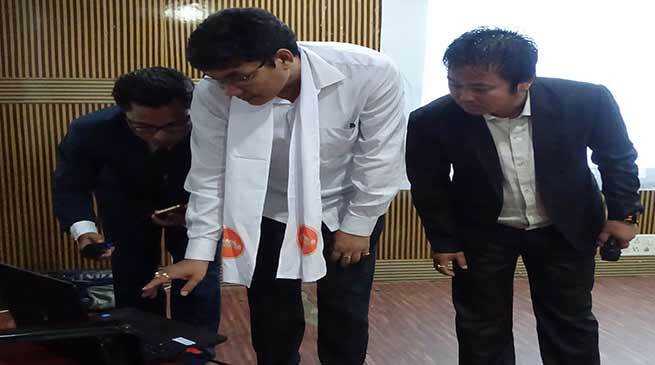 Palin MLA Takam Pario while launching official website, mobile apps and Live remote control voting system of famous ‘Ejeng Dudak musical band’ (EDMB) here at a glittering function held at hotel Benjamin on November 4 appeal all legendry to promote and preserve folk lore, folk song, culture and traditional value of tribal community..
Pario said the artist are doing their best effort in preservation of the art, culture and traditional value of the society through different forum like Arunachal Artist Forum and EDMB. And various cultural organisations of state. We have to take the music to a new height and it is being proved from the cultural performances by the artist of state at different place of performances. He wish that the artist should also imbibe for preservation of our identity, tradition and culture in future with name and fame of our tribal society, state and country. He further appeal all those who are professionals those who are engaged in different stream like games, sports, music, etc to perform their duty with sincerity with dedication and devotion for promotion economic development of family and area and to create competitive atmospheres in different professionals to compete at state, national and international level. Guest of Honour Chairman, Science & Technology Bamang Mangha in his address said that it is a happy moment that today in the modern world the EJMB have also obtained the technology to reach the society even faster even before. He assured all support from his department. Mangha while lauding the band and emphasis on preservation of of folk lore, folk songs which remind us of our identity and history. He appeal one and all to encourage such singers who have been working for preservation of cultural heritage of the society. Ejing Dudak Musical band (EDMB) Chairman Takam Dado Tallam said that it is a moment that we need to unite among all artist and time have come to preserve for folk lore, folk song which is going to be extent. He said that EDMB is organising Arunachal Music festival for exploration of folk music of different tribes of state from December 12 to 17. Arunachal Artist Forum chairman Patey Tajuk, Academician Dr. Apurva Ranjan, EDMB General Secretary Neelam Pope, Executive Member Bamang Loram among other address the gathering. ZPC Kurung Kumey Sangha Tajik, Nyishi Art & Culture Welfare Society (NACWS) Chairman Bengia Tabb, Legendry singers Bengia Hemanto, Tana Taram, Taba Kuka, Naking Perme, Karkin Chiram, Rerik Karlo, Pebi Ado Bamang, Toko Yalam Gem, executive members of the EDMB and large numbers of singers from different community and music lovers were present on the occasion. Various singers of different communities of state perform their melodies on the occasion.